Released in 2004 as a vehicle for Karl Urban, back when he was Eomer rather than Bones McCoy, and Dwayne "The Rock" Johnson, back when he was simply The "Dwayne Johnson" Rock, Doom was the latest part of a long and glorious tradition of people trying to turn videogames with plots that boil down to "Go here, shoot this thing, go there, shoot that thing" into movies which tried to justify why its characters went there to shoot that thing. 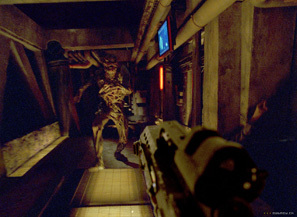 Despite coming closer than any film previously to recreating the experience of watching someone play a videogame, Doom somehow failed to bring about a new dawn for videogame adaptations. Yet, we may learn from its failure. We may learn about the world, but more importantly, we may learn about ourselves. The characters in Doom display an unusual flexibility when it comes to their defining characteristics, in that they don't really have defining characteristics until Reaper (Karl Urban) spends any time with them. The character of Goat (Ben Daniels), for example, starts the film off as just one of several faceless marines (figuratively faceless; the film would be far more disturbing - and therefore interesting - if the supporting cast looked like the extras in that section of Eternal Sunshine of The Spotless Mind where Jim Carrey starts re-entering his old memories after they've been deleted) following The Rock and Faramir around, and other than looking a bit old and weathered he isn't all that special. He certainly doesn't do anything to suggest that he is religious, and he definitely doesn't do anything to establish him as a fervent I-have-taken-the-Lord's-name-in-vain-so-I-must-carve-things-into-my-flesh type, until he is alone with Karl Urban as the sole witness to his madness.